Welcome to the haunted hovels section of haunted places in West Virginia. Please select a link below to view information on that location. This section on Haunted places in West virginia will grow fast and locations will be added when time permits, so please check back if you don't find what your looking for. Alternatively, if you know of a haunted location that isn't in the list, then feel free to submit one by clicking the above link. The Haunted hovel aims to have the most complete list of haunted locations on the web, so stay tuned, it'll be worth it. The area was a favorite hunting ground of numerous Native American peoples before the arrival of European settlers. Many ancient man-made earthen mounds from various mound builder cultures survive, especially in the areas of Moundsville, South Charleston, and Romney. The artifacts uncovered in these give evidence of a village society having a tribal trade system culture. The state has also seen a large amount of combat during the American civil war as well as being a major contributer to the coal mining and logging industry. For this reason haunted tales of this state include everything from Indians to civil war ghosts and spirit miners. Several witnesses have reported seeing children running down the halls even though this school has been closed down for quite some time now. There have reportedly been a few people killed at Wade including a woman getting decapitated and three kids dropping dead for no apparent reason. As you enter underneath a train bridge is a very sharp turn. It is very dark in there and it gives off a very strange feeling. Many people have died in that turn because they cannot see the turn until it is too late. A ghost has reportedly been seen in the road, that looks like a thin strip of fog, even when there is no other fog anywhere in the area. The theater of the school is reportedly haunted by an unknown specter. Students and faculty alike have reported feeling a "presence", usually as they are working late to prepare for school productions. If they are quiet, they have heard footsteps walking across the stage leading into the workshop. The most common occurance is the mysterious dimming of lights, even though the sound booth is locked and there is no one in there. Nobody knows for certain who or what haunts the theater, however, most witnesses claim that they do not feel threatened by the occurrences. The Graceland house which is also known as Graceland-Halliehurst Mansion. The local legends say the main haunt is a slave who was beaten to death and subsequently buried in the basement. (Which was and more than likely is still a dirt floor) There are reports of noises, feelings as if being watched and followed. This house is reputedly so haunted that a local prom was shut down. The daughter of the late Stephen Benton Elkins has been seen in her bedroom on the second floor which is now the Admissions Office. During the nights when students visit, witnesses say she would sneak up on the students, and run up and down the stairs. Reports are not only from the students, they are also from councellors as well as security staff. A ghost that has been called "Sis Lynn" is known to walk the halls and even to visit some of the residents in Louis Bennett Hall. She also has been sighted walking across the grounds between Clark Hall and Louis Bennett Hall. Her grave can be found less than 30 yards behind Louis Bennett Hall. There have been reports of noises such as furniture moving about, balls being dropped, and marbles rolling around on the ceilings in all of the dorm rooms, these noises have been reported whether someone is living in the room above or not. Dark shadowy figures have also been seen walking through the main lobby. During the 1800's a 9 year-old girl was hit by a train whilst playing on the tracks. Apparently she got lost while wandering in the woods. Her apparition has been seen by residents that live close to the railroad tracks, as the girl, wearing a white dress, still searches for her home. This has been the location for numerous sightings of a headless man wearing black walking the area. One witness statement happened many years ago, at the first creek crossing there was a shadowy figure that jumped onto the horses back as people rode through. It would then cross on the back of the horse with the rider until they reached the other side of the creek, it would then jump off again. Once a profitable mine located on a mountainside in a small community known as Ethel. Strange presences have been reprted to be seen near the mine opening. Footsteps have been clearly heard echoing from deep within the cavern, also a small light waving from within the depths has been seen slowly passing back and forth. Stories say that a long time ago there was a witch and a warlock buried in the church cemetery and the tombs were turned upside down. Witnesses say they were up there late at night and they have seen glowing in the woods and heard strange noises. Numerous sightings of the witches have been reported. This facility is reputedly one of the most violent jails that ever existed. It has been condemned and was shut down in 1995, and now claims to be the most paranormal site on the East Coast. It is said to be haunted by former inmates, and inside lights have been seen going off, and sometimes laughing has been heard, also the sound of iron doors shutting by themselves. Witnesses have reported hearing footsteps walking up stairs in areas where there are no stairs, the appearance of mysterious forms, and many other horrifying experiences. The spirits are believed to be those of past prisoners. This is a rather large old house. There are 3 floors, witnesses have reported feeling something as soon as they enter. It also has many cold spots. The sensation of not being alone, and a heavy smell of smoke and death as they entered the second floor and noises as if someone is following them up and down the stairs. At times they have seen a patch of a bluish fog around the place. Footsteps have been heard on the second and third floors. Doors slamming with no explanation and even being touch by something. There is always a feeling of being watched. On the 10th floor of the old section of the building witnesses have had the distinct feeling of being watched, also the elevator opens and people have been heard entering and exiting but not being seen. The desks at the side of the area also seem to be heavily occupied as writing can be heard from empty desks. Apparitions have also been seen. In the new section they have had the same sensations as they are coming from the older building. Witnesses say if you walk from Weirwood to the Pax City Hall at night an orb may start to follow you. If you then start running it gets in front of you and stays there until you reach the bridge. Then it reportedly turns into a man (this man is also headless). It is believed to be a man that had his head cut off by a train. He follows you until you get to the bridge. Then he reportedly jumps off to the stream below and splashes mud and water on you. Several people have made reports about this. Located nearly a mile in panther state forest there have been reports of large beems of light floating around the road and in the woods. I myself havent seen this but everyone else in my family have seen this late at night just floating around, it only stays for a short time but its there alot.! People have reported to have seen a woman standing on Stewart's Run Road and pointing at them, they haven't had time to stop the car and they end up running through her, at this point she has disappeared. Reportedly if you go in the cemetery at night, it feels like you are being touched all over by something, like you are packed into a small room that is full of people. Voices, footsteps, echoes, and people moving have been heard when walking through this school. Strange writings have appeared on the walls detailing witchcraft and unexplainable things. Also an unnerving sense of eyes upon you wherever you go. Something paranormal is definitely happening there. There are rumors that one night during a game, someone pushed a boy who played basketball into the bleachers and he cracked his head open and sadly died on the way to the hospital. The sounds of screeching tennis shoes on the gym floor have been heard, and also hearing him dribbling his ball down the court. 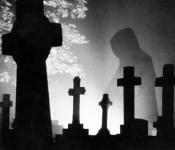 2 witnesses were in the cemetery and making records of the graves and felt like somebody was watching them. They finished and started to have a conversation describing seing and hearing children playing in the cemetery. She also thought she had seen them dressed in old-fashioned clothing, from around the 1800s. They asked some of the locals about this area and nobody wanted to talk about it. In the lower level of the hospital where the ward for the mentally ill is located. There have been reports of figures walking around, hearing moaning, and chains rattling, and some even say you can feel the pain of all the dead when you enter the rooms. It is said that the doctors buried the patients in the dirt floor, and continued to use the rooms. When witnesses have entered the rooms, they hae felt people breathing on their neck. In this place witnesses have encountered several unidentified lights, and heard lots of noise, on one occasion they heard what sounded like an army marching, it continued for about ten minutes and then grew faint. Reports of strange lights that hover in the sky and then disappear out of site. Also there have been reports of a foggy looking human or animal like a panther. Hope you have enjoyed our non-featured haunted places in West Virginia, if you know of any other locations not in the list then please click Here! to submit one, Thank you from the Haunted Hovel.